Jump to the new optimized instructions, intended for educational customers, but great for most users! With the automated build platform it will keep printing and printing. The automated build platform is a revolution in 3D printing. It allows you to have a print queue; your machine will print objects one after another. This turns your Thing-O-Matic into a little factory that sits on your desktop. Best of all, this is completely automated: you hit print, and the machine does all the work. Want to print 100 butterflies? Easy. Want to print an entire chess set? No problem. Want to start a business selling printed things that you've designed? Awesome. Have the bot do all the work while you design new things. The Stepstruder MK6 will give you thousands of hours of trouble-free printing. We've invested many hours into designing, testing, and tweaking the Stepstruder MK6. The result is an extruder that is extremely reliable, and very simple to maintain. The hot end on this extruder is essentially unbreakable and the filament drive system is one of the strongest on the market. We've successfully run these for thousands of hours. Changing the filament is a breeze with the filament pressure thumb screw. You can even swap the filament while the extruder is running. The addition of the direct stepper drive allows for new, quality-improving techniques like reversal and compatibility with 1.75mm filament. We've completely overhauled the drive system to give the optimum positioning accuracy. The entire system has been upgraded to sturdy 3/8" diameter linear shafting. This is probably overkill, but you can trust that the axes will be sturdy. We've also switched to self-aligning, sintered brass bearings. These are very forgiving to DIY assembly and provide a nice, smooth motion on the steel shafts. We've completely replaced the Z axis with a stepper driven, cantilevered stage. Guided by two of the linear shafts, this completely eliminates any Z wobble and results in nicely aligned layers. Using a high-angle lead screw, we were able to increase the speed of the Z axis from 150mm/minute to 1,000mm/minute. This means the layer changes are almost completely imperceptible. The new electronics have been designed to make the printing experience easier than ever. The Thing-O-Matic connects to your computer via a standard USB cable thanks to a USB chip on the motherboard. We've also added full endstop support so that you never need to touch the XYZ axes ever again. When you hit print, the machine will automatically home itself, heat up, and begin printing. All you have to do is sit back and relax while your Thing-O-Matic does all the work. Living in the future is awesome. Oh yeah, and the electronics are all inside, so you don't have wires dangling everywhere. Interface: Serial over USB or print from SD card. Power Usage: 500 watts, standard ATX power supply. Works with both 110v and 220v power. With integrated USB, connection is a breeze. Both the motherboard and extruder controller now natively support serial over USB, so you can connect to them with any standard USB cable. This makes connecting to them much easier and eliminates the need for a custom cable. This also makes uploading firmware a breeze as the USB allows for automatic reset of the board. Additionally, it has an SD card slot which you can use to run builds from, eliminating the need for a computer. It also has a piezo buzzer which can give you feedback on print status simply by listening. Beefier MOSFETs to handle bigger loads. We've searched high and low to find the best MOSFETs for the extruder controller. The result is an extruder controller that can drive a heated build platform and a MK5 heater block without breaking a sweat. This eliminates the need for a relay, and allows plenty of room for experimenting with driving other things that draw large currents. We've also added a molex power connector to the extruder controller so that it can safely draw all that power without sending it through the RS485 cable. This has a nice side effect of reducing noise in the comms system. Of course we didn't forget the stepper drivers — they can now handle up to 2.8A steppers. Arduino MEGA brings more memory, more pins. By using the Arduino MEGA as our base, we have almost doubled the amount of pins available. This has allowed us to do some pretty awesome stuff, with room to spare for you to modify and hack to your hearts content. The motherboard has built in support for up to five stepper drivers. You could control an XYZ platform and two stepper driven extruders. Or you could make a five-axis CNC. The sky is the limit. We've also added an interface header with 18 I/O pins that can be used to drive an LCD screen and buttons, or to hook up custom electronics that you've designed yourself. Of course the increased FLASH and RAM mean you can write bigger, more complex programs to drive your machine. Microstepping and thermocouple support up the ante. We've upgraded the stepper drivers to handle 1/8-step microstepping. This brings much quieter operation, and improved resolution. Your machine will sound better, and your prints will look nicer. We've also switched from thermistors to thermocouples for temperature measurement on the extruder. Thermocouples are much more standard, and provide a higher quality reading of temperature. You can be confident that the temperature displayed is actually the temperature of your extruder. They also bring the side benefit of coming pre-assembled and you can simply bolt them right onto the side of your extruder. 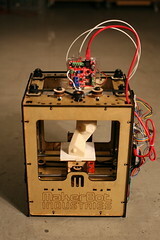 The MakerBot Industries Thing-O-Matic is Open Source Hardware and is licensed under the GNU GPLv3. The Thing-O-Matic is a derivative of the MakerBot CupCake CNC which was originally designed by MakerBot Industries. Purchase a Thing-O-Matic from the MakerBot Store.